Mondal, K., Mandal, R. (2017). A Carcinoid Tumor in the Urinary Bladder With Uncommon Clinicopathological Presentation. Iranian Journal of Pathology, 12(3), 277-280. Krishnendu Mondal; Rupali Mandal. "A Carcinoid Tumor in the Urinary Bladder With Uncommon Clinicopathological Presentation". 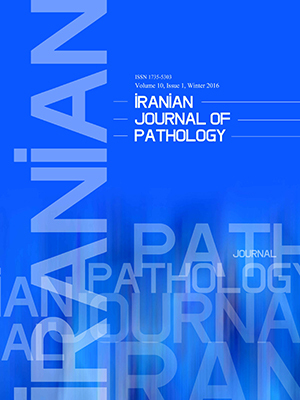 Iranian Journal of Pathology, 12, 3, 2017, 277-280. Mondal, K., Mandal, R. (2017). 'A Carcinoid Tumor in the Urinary Bladder With Uncommon Clinicopathological Presentation', Iranian Journal of Pathology, 12(3), pp. 277-280. Mondal, K., Mandal, R. A Carcinoid Tumor in the Urinary Bladder With Uncommon Clinicopathological Presentation. Iranian Journal of Pathology, 2017; 12(3): 277-280. Background: Carcinoid tumors usually originate from the enterochromaffin cells located in gastrointestinal tract and bronchopulmonary system. They may rarely arise in the urinary bladder, where this can be eventually miscued as any other commoner bladder neoplasms. The current study was conducted to connote an uncommon clinicopathological presentation by a carcinoid tumor in the urinary bladder. Case: A 52-year-old male, who initially experienced obstructive urinary symptoms, underwent cystourethroscopy to remove a tumor in the urinary bladder. The tumor exhibited insular, trabecular, and organoid architecture on histology without any necrosis or mitosis, stained positively with chromogranin A, and thereby, confirmed the diagnosis of a pure carcinoid tumor. Conclusion: Carcinoid tumors rarely arise in the urinary bladder and other genitourinary organs. But, several other and relatively more common bladder neoplasms may often deceptively simulate it. This dilemma could be resolved easily with the application of proper immunohistochemistry (IHC) in neuroendocrine tumors. 1. Martignoni G, Eble JN. Carcinoid tumors of the urinary bladder: immunohistochemical study of two cases and review of the literature. Arch Pathol Lab Med 2003; 127: e22–e24. 2. Chen Y, Epstein JI. Primary carcinoid tumors of the urinary bladder and prostatic urethra: a clinicopathologic study of 6 cases. Am J Surg Pathol 2011; 35(3): 442-6. 3. Eble JN, Grignon DJ, Young RH. Tumors of the urinary bladder and urethra. In: Fletcher CDM, editor. Diagnostic histopathology of tumors. 4th ed. Philadelphia: Elsevier Saunders; 2013. p. 610-37. 4. Manunta A, Vincendeau S, Kiriakou G, Lobel B, Guillé F. Non-transitional cell bladder carcinomas. BJU Int 2005; 95: 497-502. 5. Peterson RO, Sesterhenn IA, Davis CJ, editors. Urologic pathology. 3rd ed. Philadelphia: Lippincott Williams & Wilkins; 2009. p. 245-9. 6. Sugihara A, Kajio K, Yoshimoto T et al. Primary carcinoid tumor of the urinary bladder. Int Urol Nephrol 2002; 33: 53-7. 7. Mascolo M, Altieri M, Mignogna C, Napodano G, De Rosa G, Insabato L. Calcitonin-producing well-differentiated neuroendocrine carcinoma (carcinoid tumor) of the urinary bladder: case report. BMC Cancer 2005; 5: 88.